40 Commando RM, deployed on RFA Mounts Bay. The Marines are cleaning weapons in their accommodation in the embarked forces accommodation onboard the RFA ship. 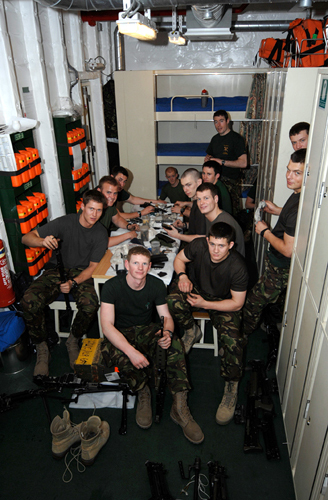 24 men stay in the 'mess', or room, and with the majority of 40 Commando and their equpment onboard, space is at a premium.